In an op-ed in today’s Daily Sentinel Chamber Board president Jeffrey Hurd cites the success of School District 51 students as key to the chamber’s “CMU 20000” initiative, which seeks ways to increase Colorado Mesa University’s enrollment to 20,000 students to benefit the local economy. Mr. Hurd clearly believes District 51 students should aspire to higher education, and particularly at CMU. So which is it? Does the chamber agree with Keenan that kids shouldn’t attend four-year colleges, or does the chamber encourage District 51 students to pursue higher education at CMU? Those aren’t the only two choices. There are two other possibilities: 1) The chamber believes higher education is suitable only for students from outside the Grand Valley, or 2) The chamber mistakenly endorsed a disastrous, utterly unfit candidate for school board. Remember previous chamber-endorsed candidate Rick Brainard? One thing is abundantly clear by now. The chamber doesn’t evaluate candidates based on qualifications, but rather based on political and religious ideology. The results of this narrow criteria can be disastrous. 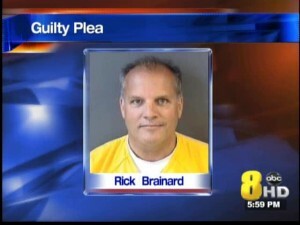 In 2013, one of their winning candidates, Rick Brainard, got thrown in jail four days after the election for beating up a woman and turning her face black and blue. The lesson is that either the chamber needs switch to using more valid and rational criteria for deciding which candidates they endorse and then take the time to get on the same page with their messaging, or get out of the business of endorsing candidates completely. It’s clear the latter would be more preferable to just about everyone. Certainly citizens would like to see the chamber be less political, and a November, 2016 survey of the chamber’s own members showed only about 6 percent of chamber members want the chamber meddling in local politics at all. Well it looks like the plan is for a truly machiavellian society. Discouraging higher education will keep the masses down and following the leaders. Very scary but I think this has been going on for a long time here and throughout the US. 25 years ago when I was in Scandinavia I was amazed at how well educated the young people were, they knew more than I did about our government and young teens had solid goals for their future.